Today we know how to take a backup or restore IMEI Number of Android device . IMEI is called the International Mobile station Equipment Identity. It is very important for identify your phone. When you flash or update ROM of MTK Android phones sometime you lose your IMEI number in this process. In this article you will know the solution of this problem. This guide is only for those phone users who lost their IMEI numbers, it is not for stolen devices. Every phone have unique IMEI but sometimes mobile phone lost it by some kind of error. Losing IMEI number is a big problem in MTK device like Micromax Canvas 2 A110, Canvas HD A116, Cynus T2 Karbonn and Spice etc. phone. If you lose your IMEI number then you cannot make call by your phone. The ability of calling of your phone will also lose if you lose IMEI number. It is a kind of identity for every phone which is essential for all phones. Step 2: You will see lots of options on your Mobile screen. Now Click on IMEI backup and restore option >>> and you will get four option first option to take backup and save file on phone internal storage and the second option to take backup and save file on your SD card. 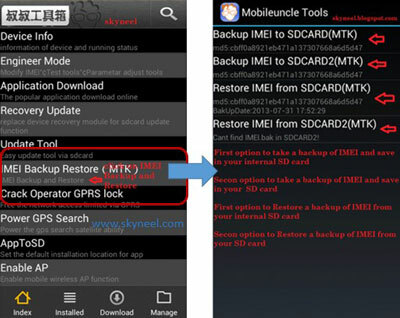 Third and fourth option for restoring your IMEI number of phone internal storage and your SD card. 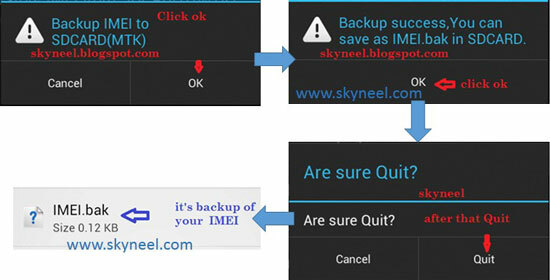 So click first option to take backup of your IMEI number and save the file on phone internal storage. I hope you like this Backup or Restore of IMEI number guide from which you will be able to easily take a backup or restore IMEI Number of Android device without any extra efforts. If feel any problem in this guide then please use comment box. Thanks to all. sir, my phone (spice mi-506) in imei invalid with imsi invalid please help me…..
your tutorial its very usefull man, thank you..
actually, my phone got bricked . then I went to the service centre to get the software loaded on my phone Micromax E313. After the software is loaded on my phone when I dial *#06# to see the IMEI , a dial up window comes up saying “INVALID IMEI” . Imei recovery file show in my sd card.now what can i do.because my phone not showing imei numbers and no network show on my micromax a114. 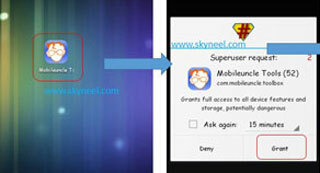 First root your phone then after install Mobile uncle tool and restore it. Just tell me all step related to restore IMEI no. And it is same as Backup IMEI no.?? i took backup of IMEI wit mobile uncle tool. all process done. but there is no bachup file in storage. Mobileuncle tool supports only Mediatek device. i have a canvas fire 2….no sim is working…imei is not showing…how can i restore my imei again…plz help me.. Here is guide to How to fix or resolve lost IMEI Number in Micromax and MTK Devices. i cant find my cds information on my mtk device. I have Samsung Galaxy Note 2, Came from Abroad (CHINA). Google was blocked in CHINA thats why Google apps does not working in my Mobile. Plz tell me how i root my mobile and all Google apps working in my Samsune Galaxy Note 2. Main kya karu Sir ????? During installing custon ROM my phone got stuck. so i flashed my phone micromax A110Q but there is no imei numbers shown in phone now. how can i get IMEI numbers back in my phone. Plz help I have not any Imei backup………. model no. micromax a111 i need a help for creat a backup of imei no. after flashed i unable to restore imei, mobile uncle tool said backup succes but restart the same problem, in about phn showing "Unknown baseband"
plzzzzzzzzzzzzzzzzzzzzzzzzzzzzzzzzzzz Give me correct solution…!!!!!!!!!!!! you have to root your phn.then open root browser.then go to root folder/data/nvram.delet this nvram folder.then reboot your phn. is it possible if yes then how ? hello i got a problem in my samsung galaxy ace s5830i.i forget to backup imei no. when i flash custom rom.after finishing flashing process i lost my imei no. how i restore it?????????????? ?plz help me…………. Is it a rule the once custom rom is flashed imei are lost.? Where the imei info is stored in the device.? If the imei file info folder is in in stock rom then it must go….. And imei be restored from somewhere? Is it so? this has happened earlier only when i flashed stock jelly bean but i restored the imei by mobile uncle tools, but for kitkat no method is working, cant edit or copy any files to system oe data or anuy root directory even after rooting. that may by because of security in kitkat please help me to restore the imei. im using micromax unite A106. When i tried mtk engg mode tool, it is saying, "This command is not allowed in UserBuild" . Plzz help. Hello sir I have lost my imei no. Please help me get back it I have no take any backup of it please help me. Dear Sir, I lost my mobile's IMEI numbers after flashin with custom rom, 3 -4 times. I tried few methods to write imei, but failed. I even forgot to make a back up of my original IMEI using mobile uncle tools. Please tell me what I should do to make my IMEI correct again. which is your phone model no.? after make backup how can i verfiy that files bro? You can see a backup file on your internal storage. Hi Abhishek, I am using Micromax Canvas 250 Turbo. Can I upgrade to Kitkat…??? Micromax not release yet, so wait and stay with us. Hi abishek, how to root canvas magnus a117? which is your phone brand? I have a micromax canvas HD. I have lost its IMEI no. i want to restore it using Mobile uncle tool but i had taken its (imei) back up. Sir, can you give me the IMEI file. So, that i can restore its IMEI no. SIR, I HAD NOT TAKEN ITS BACK UP. CAN YOU PLEASE GIVE ME THE FILE. SO THAT I CAN RESTORE. I HOPE U WILL HELP ME! don't say sorry but how can i give you, your IMEI number backup file? you can recover your lost IMEI number by follow these processor. I follow that processor but nothing happens. When i press SEND COMMAND. Nothing happens. I is just at it was. Not even IT SAYS FAILED OR SUCESS.Nothing happens. If i root my CANVAS TURBO for updating rom , After Updating the rom if i unroot my phone means My warranty is claimable or not? if you flash stock Rom on your Rooted phone then warranty come back and if you full unroot your phone by SU app then also warranty come back. is it working or Not Working ? my phone is under warranty, so i dont want to root it…is there any other way to take back up of the IMEI no. yes root required which is your phone model and brand? is there a kitkat update or latest jelly bean update for Micromax A110? i want to update my micromax A116 how to do it i dont know please tell me ??? which is your phone Brand and model? I Got error given below when i try to install. I rooted my MicroMax Canvas Lite A92 but I don't find difference then regular phone. i lost my canvas A110Q IMEI No. by doing flashing rom! I TRY THIS BUT NOT WORKING!! are your phone rooted ?